An exceptional vatting from now gone Hanyu and newly born Chichibu distilleries. 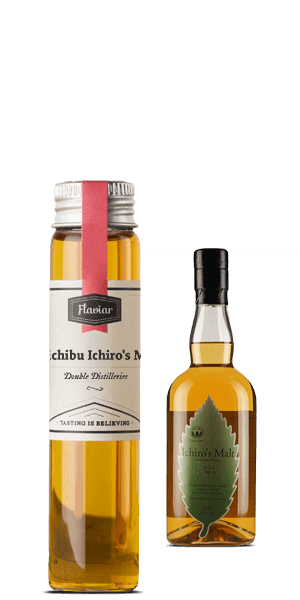 The sherry matured Hanyu and new made Chichibu aged in Japanese oak cask combines sweetness of Hanyu and oriental flavour of Chichibu in an exquisite harmony. This non chill filtered and non coloured liquid beauty was vatted and bottled in 2010 and is quite scarce... No wonder! What does Chichibu Ichiro's Malt Double Distilleries (Tasting sample) taste like? The Flavor Spiral™ shows the most common flavors that you'll taste in Chichibu Ichiro's Malt Double Distilleries (Tasting sample) and gives you a chance to have a taste of it before actually tasting it. It is an outstanding, delicate vatting with a long & soft finish.